Bloggin' 'bout Books: Merry Christmas in July (With A Giveaway)! So what if it's a sweltering 110 degrees outside? Who cares if the mere thought of putting on a sweater makes me break out in a heat rash? Does it really matter if Christmas is 5 months away? Let's celebrate now. Merry Christmas in July! One of the great things about Disney is that not only do they provide me with newly-published books, but they also allow me to make selections from their backlist. That's how I ended up with 2 or the 3 holiday picture books I'm going to review here. The last book was just published - it's so new I couldn't find a picture of it on the Internet. Now, what would Christmas be like without presents? Probably filled with more peace, gratitude and love ... ANYWAY, read all the way to the bottom of this post to find your "gift" - a chance to win a free book. I'm really excited about this first one. A few years ago around Christmastime, I was looking for a new holiday read aloud. I noticed Are You Grumpy, Santa Claus? by JibJab creators Gregg and Evan Spiridellis. It looked funny, so I bought it. It didn't take long for it to become a favorite around our house. 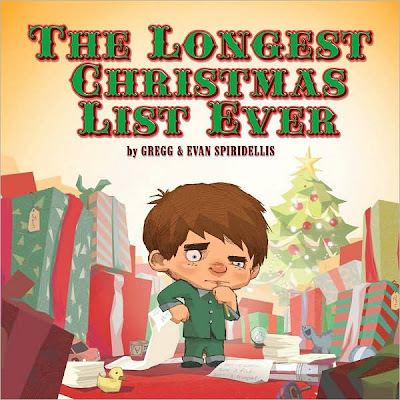 So, when I saw that the Spiridelli brothers had penned another holiday tale, I had to have it. While The Longest Christmas List Ever isn't nearly as funny as the first story, it's just as engaging. With bright, colorful illustrations, it tells the story of Trevor, a boy who wants to make sure he gets everything he wants for Christmas. Soon, his list's so long it bursts out of his house and winds down Main Street. When he attempts to mail it to Santa, Trevor will learn an important lesson about Christmas. I'm not familiar with Jonathan Allen's other books, but apparently he's written several others in the "I'm Not" series. 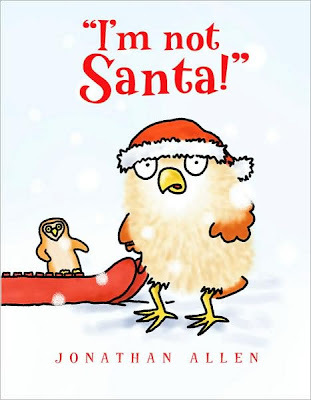 In "I'm not Santa!," Little Hare mistakes fluffly Little Owl for Santa Claus. The more Little Hare insists, the more frustrated Little Owl grows. It takes a special visitor to calm them both down. Simple illustrations and a funny storyline make this a fast, enjoyable read. It's sure to get some laughs from the 4-5 year old set. If you're a Tim Burton fan, you'll enjoy this next one: The Thirteen Days of Christmas by Steven Davison and Carolyn Gardner (illustrations by Tim Wollweber and Sherri Lundberg). This ghoulish version of The Twelve Days of Christmas features characters from The Nightmare Before Christmas counting down in their own special way. Tim Burton's style is a little too bizarre for me, so I wasn't all that impressed with this one. I requested it because my 10-year-old is a fan. If you are, too, chances are you'll appreciate it more than I did. For seventeen-year-old Helena Waite, summer means more than just a break from school - it means Southpoint. Each July, Helena returns to the summer camp with its familiar routines, landmarks, and faces. This year, however, she is returning not as a camper but as a counselor. The only downside? Her best friend, Katie Bell, is still a camper. As the days begin to heat up, Helena discovers that the innocent world of bonfires and field days has been pushed aside for late-night prans on the boys' camp and skinny-dipping in the lake. To fit into this new life, Helena finds herself turning her back on Katie Bell, and when a longtime crush becomes a romantic possibility, life gets even more confusing. With the carefree summers of her past slipping through her fingers, Helena begins to wonder why growing up means having to change. 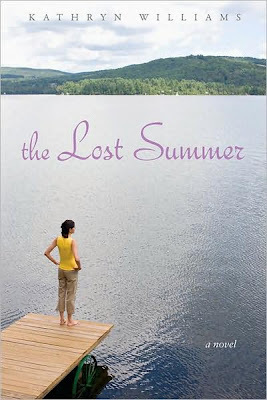 Told with honesty and heart, Kathryn Williams's second novel tackles the timeless themes of coming-of-age, summer romance, and, of course, the power of friendship. Like it or not (and I'm in the not camp), summer's not over yet, so I thought this would be a good Christmas in July giveaway. If it sounds like something you'd be interested in, all you have to do is complete this sentence: All I want for Christmas is ... I'll draw the name of one winner on August 12 (the day my older kids go back to school - woo hoo!). If you blog about the giveaway, I'll even give you an extra entry. See, how that giving thing works? Nice, eh? Oh yeah, the contest is open to readers everywhere. Good luck! Everyone seems to have Christmas books to read every year?? Except for the Bible, havent found one yet. All I want for Christmas is a literary agent! All I want for Christmas is a new bed set!! All I want for Christmas is a happy, healthy family and time to spend it with them. Thanks for the great giveaway! All I want for Christmas is my nice little family, intact. Also, I like the idea of meditating on snow, right now. storybooks for kids cost effective and fun for kids and toddlers. all I want for christmas is books, books and more books,,thx for contest..
All I want for Christmas is to start building my dream home on our land! ps: can't wait to go check out the books you reviewed- they sound like awesome read-alouds for the winter months! Thanks for the giveaway. All I want for xmas is a mild winter and my family at home. All I want for Christmas is to be happy and to have enough money to buy my children everything they deserve! All I want for Christmas is a potty-trained kid who never says "No!" All I want for Christmas is to have all 4 of my grown kids here with my husband and me! All I want for Christmas is ... continued good health for my family. all I want for Christmas is health and happiness for friends and family. All I want for Christmas is to be with my family - and reading lots of books. All I want for Christmas is a new fancy shmancy lens for my camera!!! All I want for Christmas is Christmas Eve dinner with all the kids and grandkids......and perhaps a generous gift certificate to B&N. All I want for Christmas is a peaceful, healthy year for us -- one better then we've been having! Thanks for this wonderful contest!! All I want for Christmas is for all my family to be safe & Happy...oh and Warm. What a wonderful giveaway you go girl!!! All I want for Christmas is...for my family to be together. Thanks for this giveaway and please count me in. All I want for Christmas is... A Big Bag of Books! is to see my family in england and australia.